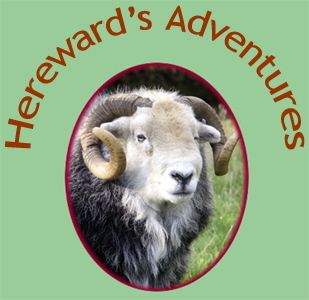 Hereward travels to the picturesque village of Caldbeck, now a peaceful rural backwater but in its industrial heyday a place of dark satanic mills. The River Caldew, upstream from the village. Caldbeck takes its name from the river Caldew, which runs through the centre of the village. The name is probably derived from the old Norse kaldr bekkr meaning cold stream. Yet it wasn’t always so idyllic. During the 18th and 19th centuries, Caldbeck became an industrial powerhouse. The fast flowing Caldew was used by a variety of mills including corn, paper, beer, wool and bobbin, while the exploitation of the local fells for their mineral wealth reached its peak during the early 19th century. The remains of the bobbin mill stand where the Caldew powers its way through a gorge, known as The Howk. Howk is a north country term meaning to scoop out. Built in 1857, the bobbin mill had for a time the largest water wheel in the country. They nicknamed it Red Rover and it became a tourist attraction during the Victorian period. Looking down into The Howk. Dated door lintel from a year in which London was experiencing a few problems. The Old Smithy in the village centre, formerly a dyeing house for wool, now a tea shop and gift shop. Gate House, once the home of the woollen mill owner John Woodcock Graves, who composed the famous song about his friend, the local huntsman, John Peel. The Caldbeck woollen industry made a hard-wearing grey cloth from the wool of the Herdwick sheep mixed with a little Leicester wool. The cloth was waterproof due to the mixture of grease and tar that used to be smeared on sheep before the days of dipping. It is said to have lasted a lifetime. The Peel gravestones. The white stone belongs to John Peel. John Peel’s ‘coat so grey’ was provided by John Graves’ woollen factory. The Caldbeck Fells were rich in minerals, including copper, silver and lead. Mines were worked from Elizabethan times up until the 20th century. Fell ponies beneath Carrock Fell. This fell was the source of much of Caldbeck’s mineral wealth. 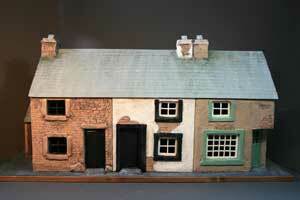 During 1827 there were 7 ale houses in the village to fuel the spirit of the resident mine and mill workers. At one time, that was almost one ale house for every mill.